Hosted again this year in Washington DC at the Gaylord National Resort, this conference was a new one for me that aligns with the Red Hat Cloud Suite product at Red Hat. It was a good place to spend time in a few sessions around bimodal IT and how markets are supporting Clouds that are public, private and hybrid. It would also be a good place to interact with customers and markets that own supporting operations at scale needing to deal with all the aspects of Cloud. 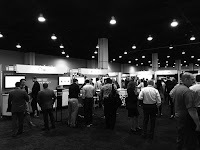 My plan includes being at the booth for all hours that the marketplace would be open to interact with the attendees and expand both awareness for Red Hat as well as getting the feel for our Red Hat Cloud Suite materials in a run up to Red Hat Summit. Having an application developer background I was interested in the workloads, the questions and how operations would be targeting Red Hat as a vendor at this conference. 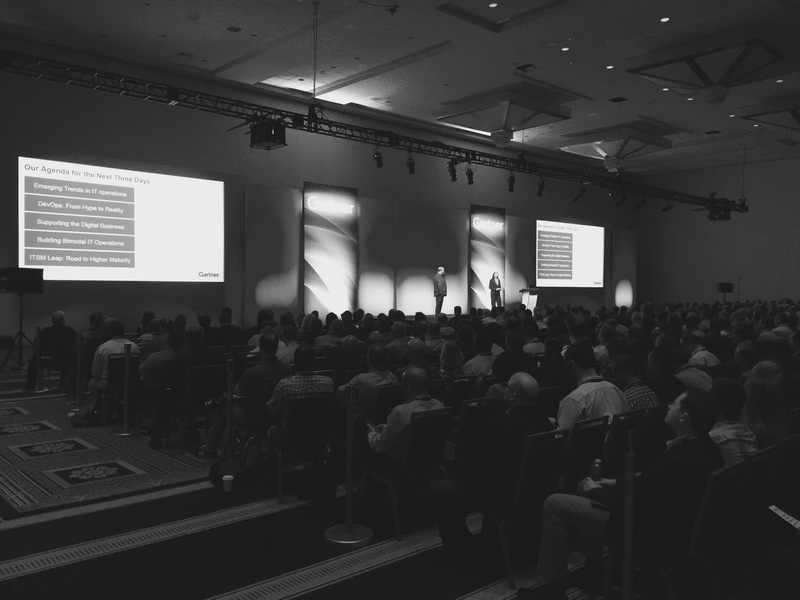 Today kicked off with a few keynotes that dug into IT operations as going through change due to new tools and processes along with the speed at which operations needs to deal with fluidity of assets in organizations. I then headed to a talk by Dennis Smith (Gartner) on bimodal IT where he presents what he has been seeing around workloads going from pure public Clouds to either private and/or hybrid Clouds. He also pushes for taking care to structure workloads for eventual movement between Cloud infrastructures, which is nice but often not all that easy when you look at the current vendor specific issues that public Cloud providers have in complexity, lock-in and lack of tooling. Mentioned in less detail were these private Cloud users now working to include public for a hybrid solution; Chevron, McKesson, Cox Automotive. The booth opened in the afternoon and in the evening with a short pause for a late lunch with an OpenShift colleague. There was a real interest in our new Cloud Suite along with the Ansible presence at the booth. Queries ranged from the entire story around migrating workloads from physical to virtualization to OpenStack and on into the specifics around attendees current infrastructure questions. 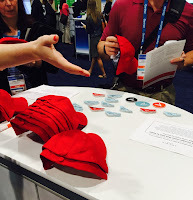 The Red Hat baseball caps were gone in the first hour... amazing to see how many of the attendees made a point to grab some Red Hat swag! 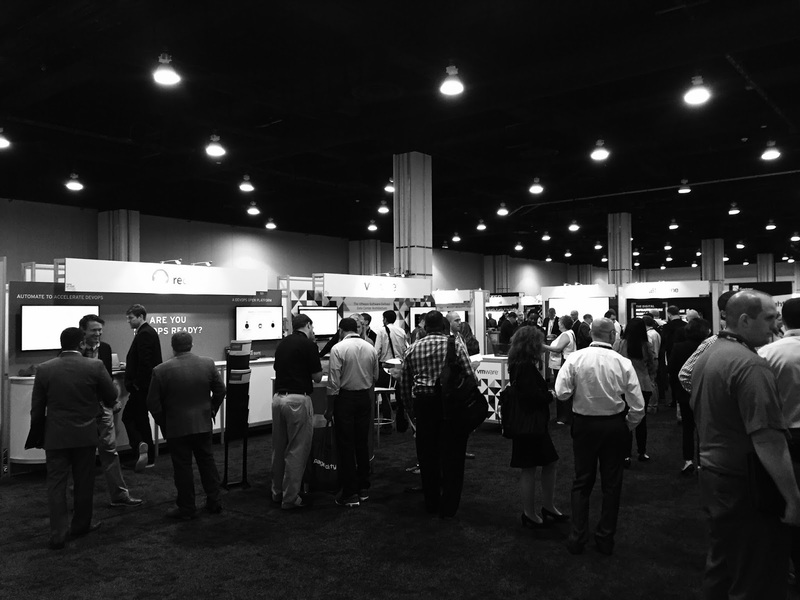 A short tour of the vendors in the marketplace showed a mix between software, services and hardware vendors. Not something you see every day at a Gartner event and I even talked with one of the hardware vendors who was very interested in finding someone to help with large scale hardware discovery / analytics. He was overwhelmed that PaaS & SaaS, "...have gone crazy viral out there in the data centers and we are having trouble sorting out the mess we encounter when brought in." The Red Hat Cloud Suite booth demo slides got positive feedback and showed off a few of the demo videos to interested attendees. 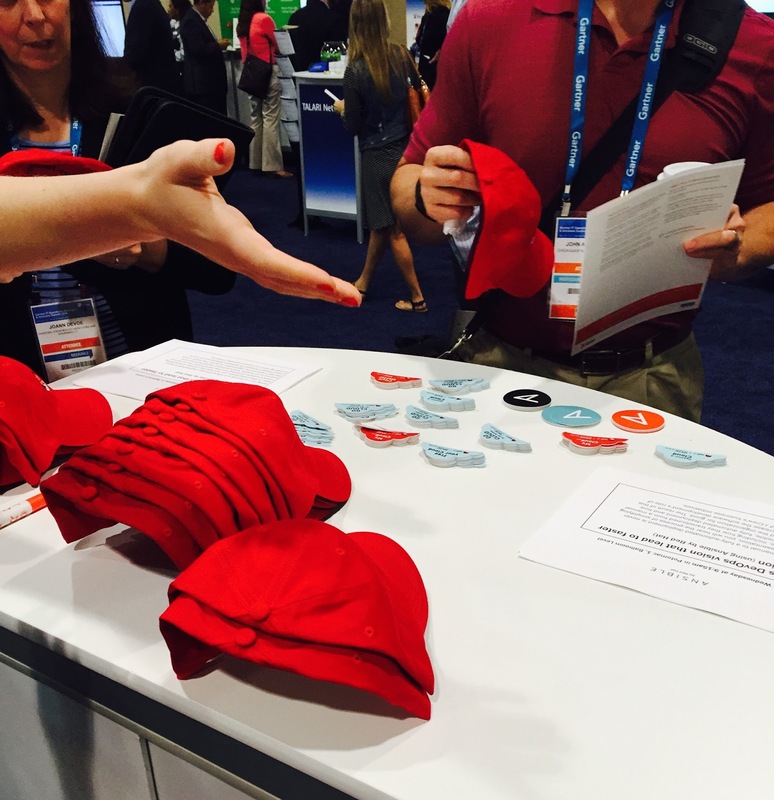 Red Hat was a known entity and the story around Open Source was understood. 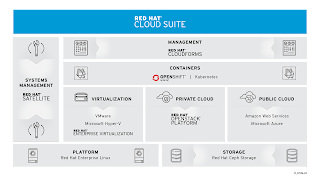 More than a few were current customers / users of various aspects of Red Hat infrastructure. I heard wandering the marketplace that attendee totals were around one thousand. The keynote today was based on the speakers book and focused on how to deal with organizational conflicts as a leader. Not much to add there, was not super exciting. My first session was one where online retailer J.Crew talked about their experiences with transitioning into a DevOps Ansible based release process for their website development. There was a lot of interest in the audience with multiple questions around Ansible Tower technology. Bottom line, the transition to agile development and operations is a gradual and ongoing process. Another session I was able to attend before heading back to the booth for the afternoon was on the impact of IoT on IT operations and bimodal strategy. This session was designed to help attendees to define what IoT really is, what it might mean for their business and how they might approach getting started with IoT. A really cool customer story was European (UK) health company Pruhealth, giving customers vitality points via their FitBit armbands to reduce your health insurance premiums. This is something I think I need to check out as I have been a fan of FitBit since it came out! Bimodal is alive and well. On a side note, while there has been some mention of bimodal being old news, it seems here bimodal IT is still a very strong topic in the market and not even close to being retired by Gartner or customers in their conversations around operations, strategy, IoT and cloud. To review, bimodal is about two modes. Mode 1 is about running what you have and ensuring that the services are there for the customers you have. Mode 2 is about differentiating and innovating with new, agile and hybrid infrastructure, architectures and applications for your customers. Between sessions it should be noted that you often have trouble getting to the next session you might have wanted to see, not because of the distance between sessions, but because you are embroiled in a conversation with some attendee you bumped into or sat next to. This conference is full of interesting people you will want to have conversations with and add to your network, so make sure you put on a smile every day here while in attendance. Another session was Should you use OpenStack as your Private Cloud IaaS Platform and to my surprise this was sparsely attended, maybe thirty attendees in a room designed to hold hundreds. Does this mean that OpenStack is not interesting? I think not, but more that attendees feel that OpenStack is well know, evaluated and maybe even being used in their organizations so that they chose to spend there time at one of the other offered sessions in this time slot. The speaker covered what OpenStack is and what it can do for you to turn your infrastructure into a cloud environment. Several use cases were presented showing where the use of OpenStack was successful. He also covered managed vs self implementing your private cloud with OpenStack due to the complexity of implementing it yourself. OpenStack is not easy and skills are a real requirement that you need to find and acquire. The final afternoon marketplace tied me down to the Red Hat booth for conversations around Red Hat Cloud Suite, OpenStack, RHEV and a few conversations around migrating workloads from VMWare. Funny enough, this last topic came up a few time while the attendee talking to me had their backs to the booth next door to us, VMWare's booth. There was a third day but I was unable to attend this one and hit the road for home. My impressions about this event were that there is definite value for operations, cloud and even some hardware customers and vendors. It was a well focused, well organized event that had enough traction to gather together an estimated one thousand attendees. It had a very accessible and cozy organizational feel with a vibrant and active marketplace. I look forward to attending again next year and hope to bump into you there!